The Celestron SkyProdigy 70 Computerized Telescope is one of three models in the series. 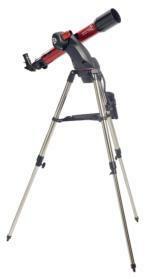 This telescope is a truly revolutionary product with ground breaking technology. This scope is the end result of many years of telescope advancements. It combines electronic motors, an intelligent on-board computer, a digital camera and StarSense™ technology to create an automatic, instant alignment telescope that requires no input from the user. You simply turn it on, push a button and enjoy the view. It really is that easy. The automatic alignment process takes only a couple of minutes, you will then be in a position to select from thousands of objects to view. Not sure what to look at?